The pureness and clarity of 42 Below's multi-award winning vodka is combined with the sweet round tartness of passionfruit to create this most softly nuanced of tipples. And it is all in the method. No sugar, no fruit concentrate, no artificial ingredients - 42 Below passion-fruit vodka is the purest of vodka infused with the purest of passion-fruit. The very essence of the fruit is distilled from its pulp and steeped into the vodka to achieve a blend that is as cool as it is warm, and as soft as it is dry and it's the perfect base for a diverse range of drinks. Try it long and tall, with citrus juices, tonic and ice, sip it on the rocks or in a cocktail of your own! 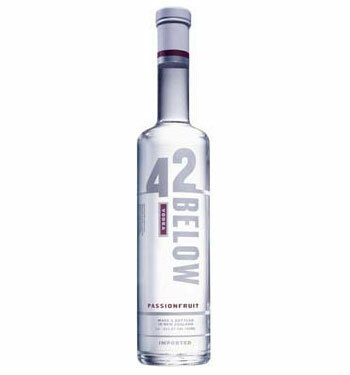 42 Below Vodka's have won numerous prestigious international awards including gold medals (for the third year running) at the 44th World Selection of Spirits and Liqueurs 2006, the San Francisco Spirits Awards and the UK International Wines & Spirits competition.